This evening Richard Lewis, Sergeant, with the Office of the Chief of Police for the Santa Monica Police Department sent a copy of the press release regarding the arrests and recovery of the art to the ARCA blog. SMPD's Sergeant Lewis also responded to two questions via email: did the publication of the photos of the artwork assist in the recovery of the art? Did the owner's offer of a reward assist in the recovery of the art? The photos were absolutely a help to the investigation. As for the reward that was offered by the victim, that may have played a role, but at this stage in the investigation, I cannot speak to that. On September 26, 2012, investigators from the Santa Monica Police Department were contacted by members of the Pasadena Police Department who received a tip concerning where the stolen art from Santa Monica was being held. Based on the information received, Santa Monica’s investigators, with the assistance of the Pasadena Police Department, responded to Al & Ed’s Autosound located at 30 S. Rosemead Boulevard in Pasadena to serve a search warrant. During the subsequent search, most of the paintings were recovered and one suspect was arrested for possessing stolen property. 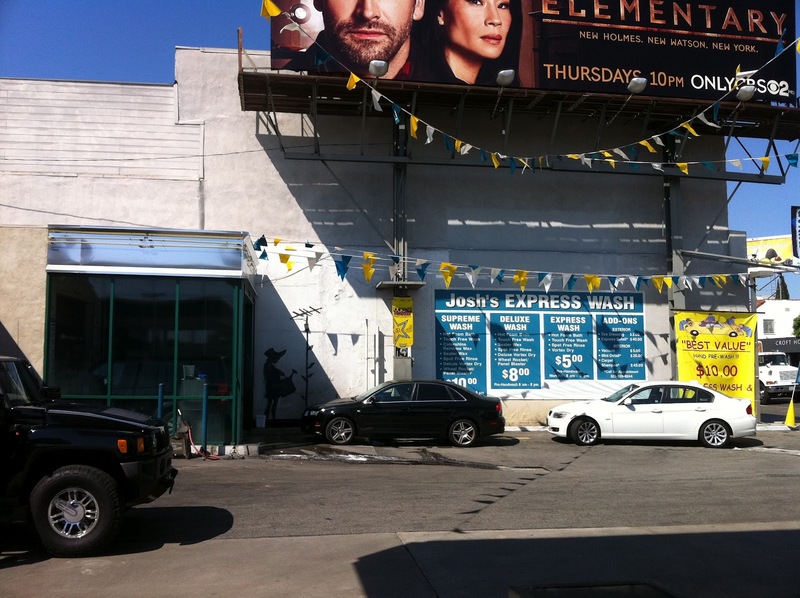 He was identified as 45 year old Jay Jeffrey Nieto of Canyon Country, the manager of the Pasadena Al & Ed’s. As the investigation continued, additional information was developed that led Santa Monica investigators to a residence in the City of San Gabriel. There the investigators contacted and later arrested 40 year old Wilmer Bolosan Cadiz for possessing stolen property; he was in possession of four of the stolen paintings. 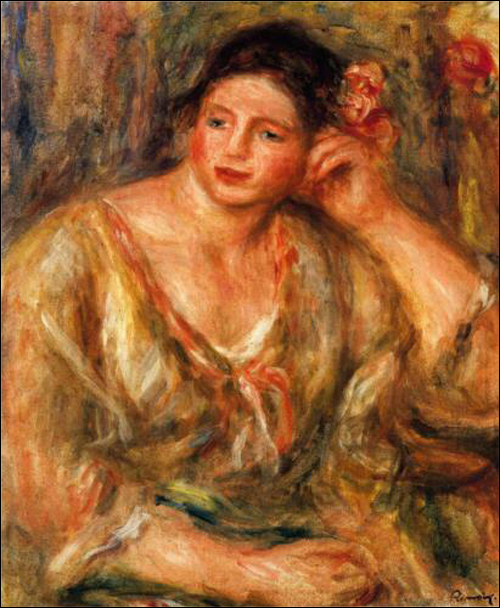 The last painting was recovered as investigators learned it had been transported to a residence in Glendale. The subject in possession of this painting has been interviewed and is cooperating with investigators. Santa Monica Police Investigators are continuing to follow up on leads regarding other possible suspects in the burglary and the location of the remaining stolen property. Anyone with information is asked to contact Detective David Haro at (310) 458-8432 or Sergeant Henry Ramirez at (310) 458-8453 or the Santa Monica Police Department (24 hours) at (310) 458-8495. Although the investigation continues, cooperation from the following agencies has made the recovery of this valuable art collection possible. If you wish to remain anonymous, you can call We-Tip at 1-800-78-CRIME (1-800-78-27643), or submit the tip online at www.wetip.com you will remain completely anonymous and may be eligible for a reward, up to $1,000.00 if your information leads to an arrest and conviction, or anonymous tipsters can contact Crime Stoppers by either calling (800) 222-TIPS (8477) or by visiting their website at www.lacrimestoppers.org. To text an anonymous tip to crime stoppers; please view their webpage for detailed instructions. If the information leads to an arrest, the tipster is eligible to receive a reward up to $1,000.00. Star bond trader Jeffrey Gundlach said his $10-million collection of art, which was stolen this month, has been recovered safely. Two suspects have been arrested by Santa Monica police, he said. 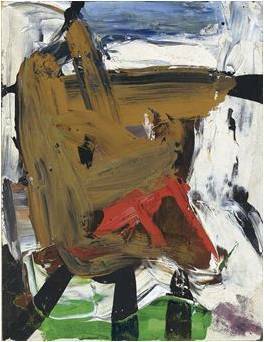 Gundlach had offered a near-record $1.7-million reward for the collection's safe return. Joe Bel Bruno for the LA Times reports that Gunlach said that 'at least one of the paintings [the Mondrian] was in the midst of being sold" and that his Porsche is still missing. Sam Ro for Business Insider reports that Gundlach released a statement thanking Detective David Haro and the Santa Monica Police Department for "their skillful, tireless and respectful attention to apprehending the criminals and recovering all of the artwork stolen." Santa Monica is a liberal seaside town -- once nicknamed 'The Republic of Santa Monica' -- offering access to beach and upscale amenities just 30 miles west of downtown Los Angeles. This community of rent controlled apartments (located south) and multi-million dollar homes (located north) around Montana Avenue attracts homeless people to the parks and families to the good public schools. Last year James "Whitey" Bulgar, Boston's notorious Irish mobster and one of the FBI's most wanted criminals for almost two decades was found in a rent-controlled apartment just blocks up from the busy retail district known as The Third Street Promenade. 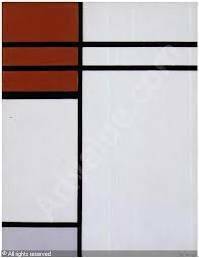 Now one of Santa Monica's residents, a wealthy art collector and bond trader, has offered a substantial reward, including $1,000,000 for the return of his painting by Piet Mondrian, for art stolen from his home in September. Jeffrey Gundlach, founder of the investment firm DoubleLine Capital, held a press conference September 24 to offer a $1.7 million reward for the fine art paintings and other objects taken in a burglary now being investigated by Santa Monica police ("Reward offered by L. A. bond guru adds to intrigue over art theft", Los Angeles Times, September 24, 2012). Gundlach is offering $1 million for the "undamaged return" (or information leading to) of a picture by Piet MOndrian and another $500,000 for the "successful return undamaged" of "Green Target" by Jasper Johns and two box constructions by Joseph Cornell ("Bond trader offers $1.7-million reward for stolen art collection"LA Now, Los Angeles Times). At the brief press conference, Gundlach said "no comment" regarding questions about whether or not the 13 pieces of fine art were insured and or any details about the burglary or the investigation. 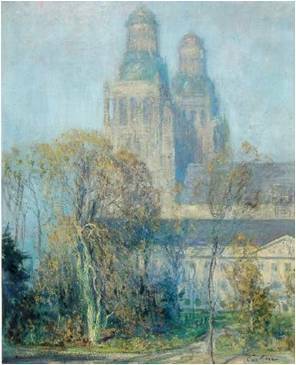 In this article, the LA Times showed images and identification provided by the owner of ten of the 13 stolen artworks: "The Cathedral Tours", 1916, by Guy Rose; "Glory of Autumn", 1930, a California landscape by William Wendt; "Untitled", 1958, abstract by Franz Kline; "Number 14," 1949, by Bradley Walker Tomlin; "The Desert Ramparts", 1920, an oil painting by Hanson Duvall Puthuff; "Green Target", 1956, by Jasper Johns; "Composition (A) En Rouge Et Blanc", 1936, by Piet Mondrian; "Medici Boy", 1946, a wood box construction by Joseph Cornell; and "Painting", 1950, by Philip Guston. 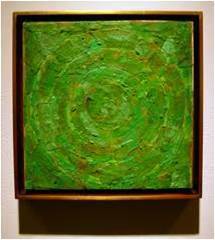 Here's a link to the online Santa Monica Patch which also identifies stolen paintings by Frank Stella and Cy Twombly. On September 14, 2012, officers responded to a residence located in the 500 block of 12th Street on the report of a residential burglary that had occurred sometime between September 12th at 3 p.m. and September 14th at 8 p.m. The victim had just returned home from a trip and discovered that his residence had been burglarized. Numerous high-end paintings and two wooden box art pieces had been stolen from various rooms throughout the home. Also stolen was the victim's 2010 red Porsche Carrera 4S, which was parked in the garage, several expensive watches, wine and a small amount of U. S. currency. The estimated loss at this time is believed to be in excess of 10 million dollars. Preliminarily, the the estimated loss is between 20 and 39 million dollars. Here's a link to the images of the items reported stolen; Sergeant Richard Lewis is the contact person for the police department (richard.lewis@smgov.net). Although the LA Times (in the above referenced article) names stolen art work as by Jasper Johns, Piet Mondrian and Richard Diebenkorn, the Santa Monica Police department does not identify the artwork by title or artist. A search through the FBI's National Stolen Art File Search did not show any stolen paintings by either of the three artists. Here's a link to a 12-minute video discussion between the Los Angeles Times business section journalist and former FBI agent Robert K. Whittman (. 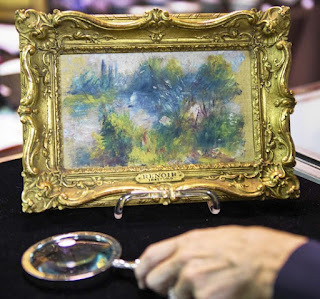 Business reporter Stuart Pfeiffer asks Whittman if it is more likely that the only 'buyers' the art thieves will find for the stolen fine art are undercover law enforcement. The Egypt Exploration Society (EES) welcomes participation in its September 29 'webinar' discussion, led by panellists including David Gill (of 'Looting Matters') and Marcel Maree (of the British Museum) on the issues of the (legal) antiquities trade and Egyptology. The panellists will include: Prof. David Gill, Professor of Archaeological Heritage at University Campus, Suffolk, and author of influential blog Looting Matters; Madeleine Perridge, Head of the Department of Antiquities at Bonhams Fine Art Auctioneers and Valuers; Marcel Maree, Assistant Keeper in the Dept of Ancient Egypt and Sudan, British Museum; Heba Abd el-Gawad, PhD Student in Egyptology, University of Durham, and recipient of an EES Centenary Award in 2012. The details of the event can be found here: http://ees.ac.uk/events/index/172.html. The Maiden Heist (2009, now on DVD) tells of how three bland security guards (played with dry humor by Morgan Freedman, Christopher Walken, William H. Macy) steal their favorite works of art which have been targeted to move from Boston to Denmark. The art works featured were created for the movie. The Maiden Heist is a love story about the personal magnatism of art and its ability to transform our lives by love as shown in the movie's subplot (Marcia Gay Harden plays the wife of Christopher Walken, a hardworking beautician with dreams of a warmer climate). 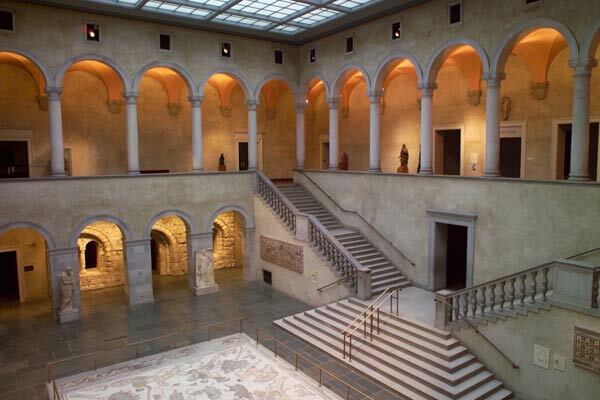 This heist movie was partially filmed at Massachusetts' Worcester Art Museum. In December 2007 the Worcester Art Museum "allowed movie makers to transform its Renaissance Court and galleries into a set for the $20 million feature film The Maiden Heist" (ARCA Trustee Anthony Amore and journalist Tom Mashberg in their book Stealing Rembrandts (Palgrave Macmillan, 2011). 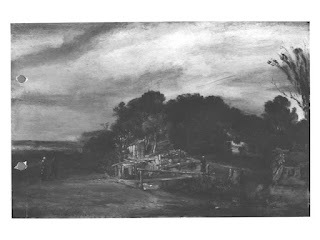 Forty years ago, on Wednesday, May 17, 1972, two men hired by Florian "Al" Monday entered the Worcester Art Museum late in the afternoon and removed four paintings from the walls 'in such a methodical manner' that museum 'visitors assumed the thieves were museum employees doing their jobs' (Stealing Rembrandts, page 42). Then the two thieves 'remembered to pull down the blue-and-orange ski masks' (SR), placed the selected paintings into sacks, and walked to the main entrance of the museum. Unfortunately, museum guard Philip J. Evans grabbed one of the thieves and was shot. The four paintings (Gauguin's Brooding Woman and Head of a Woman, Picasso's Mother and Child, Rembrandt's St. Bartholomew) were later recovered. The DVD for The Maiden Heist showed a trailer for St. Trinian's, a comedy about free-spirited girls who save their boarding school from bankruptcy. Under the tutelage of a criminal played by Russell Brand, the students concoct a plan to steal Vermeer's The Girl with the Pearl Earring from the National Gallery in London (this painting is owned by the Mauritshuis in The Hague). The caper involves blowing up sewer gates, high wire climbing, and dancing through security beams. A copy of Vermeer's painting is sold on the 'black' market and the original is found by a couple of St. Trinian's schoolgirls. Both movies can be viewed by middle-school and high-school students. Other paintings of St. Bartholomew by Rembrandt can be found at the Timken Museum of Art in San Diego's Balboa Park and Los Angeles' Getty Center. Documentary filmmaker Brent E. Huffman will return to Mes Aynak this December for what some archaeologists call the ‘funeral’ of the ancient site which will be cratered to extract copper (valued at over 100 billion dollars) underground, potentially setting a dangerous precedent for other ancient sites on top of gold, copper, oil and coal mines in Afghanistan. Huffman and German Camera Productions initially set out to record the Buddhist monasteries and stupas in “the red zone” of this ancient city before a Chinese state-owned company, China Mettalurgical Group Corporation, (MCC) begins work on a 30-year lease (for which they paid $3 billion) to extract copper by demolishing the entire mountain range. The Mes Anyak archaeological site was rediscovered in the 1960s. Researchers now believe the site not only provides artifacts from the 1st through the 5th centuries but also going back to the Bronze Age. The 400,000 square meter site was never fully excavated or protected from looting during the decades of almost continuous fighting in Afghanistan. “Archaeologists are frantically performing rescue archaeology which is pretty destructive. Like looting, much of the context gets lost as archaeologists rush to salvage moveable objects,” Huffman said, explaining that DAFA, the French archaeological delegation, and Afghan archaeologists have worked intermittently over the past two years through harsh weather and dangerous war-zone conditions at this former Al Qaeda training camp. 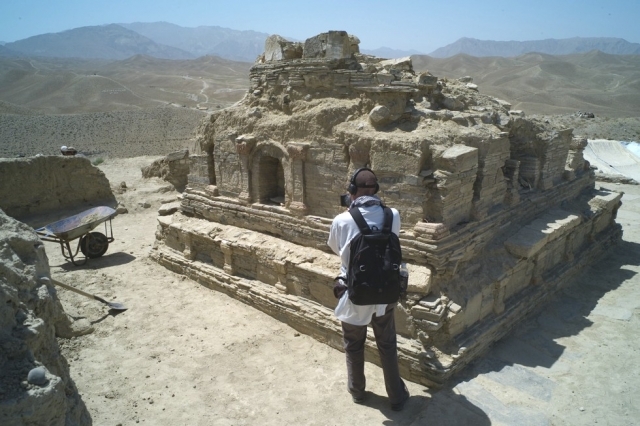 Local people from Logar province have been involved in the digging and the unearthing structures, according to Huffman. Afghan archaeologists work with crude tools and often protection of the artifacts is limited to coverings by plastic tarps and wooden crates. Here's a link to the petition to President Hamid Karzai to prevent the destruction of the archaeological site Mes Aynak and a relevant Facebook page, The Buddhas of Aynak. Here's a link to the article Huffman wrote for the Asia Society on this subject. What are Buddhas doing in Islamic Afghanistan? In addition to the gigantic Buddhas destroyed by the Taliban in 2001, another Buddhist site, Mes Aynak, in Afghanistan is being threatened by the country's desire to improve its economy by extracting natural resources. Archaeologist believe Afghanistan may have been farmed by humans for as long as 50,000 years. Today's war-torn Afghanistan, with commercial centers and an art culture dating back to the Bronze Age, was controlled by numerous empires and dynasties -- Aryans and the Medes, Achaemenid invasion and Zoroastrianism, Greco-Bactrian rule, Maurya Empire, Sassanid Empire, and the Shahi dynasty. Darius the Great marched his Persian army into the region in 500 BC, almost two centuries before Alexander the Great defeated Darius III. The inhabitants of the area traditionally practiced Hinduism then Buddhism when it became part of the Kushan Empire in the first century. 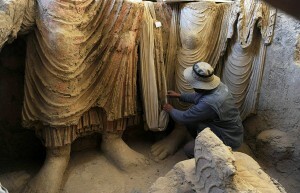 Located 18 miles south of Kabul, the ancient site of Mess Aynak was rediscovered in the mid-20th century. Now archaeologists have less than four months to extract artifacts from Mes Aynak before a Chinese company begins mining the world's second largest copper deposit. The Alliance for the Restoration of Cultural Heritage (ARCH International) explains in a video the cultural importance of the monasteries and fortifications of Mess Aynak and the other pottery and jewelry found at this 5,000 site. 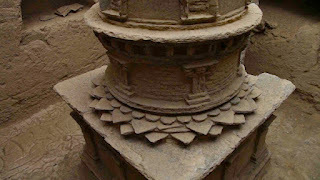 The organization asks that responsible mining methods be used to help preserve the most important archaeological sites. 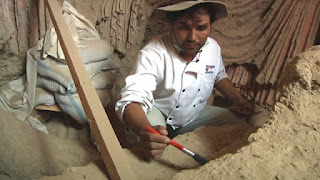 Here in a CNN video, documentary filmmaker Brent E. Huffman also shows the archaeological digs at Mes Aynak which will be closed in December. According to Mr. Huffman, it would take 30-35 years to properly excavate this site. A petition to President Hamid Karzai requests the preservation of the ancient site of Mes Aynak. Here's a link to the petition. Another petition sponsored by the Association for Protection of Afghan Archaeology (APAA) with more than 13,000 signatures asks UNESCO to include Mess Aynak, Afghanistan, on the Endangered Sites and the World Heritage List. Afghanistan ratified UNESCO's 1970 Convention in 1979. Two cultural sites are listed on the World Heritage List: Cultural Landscape and Archaeological Remains of the Bamiyan Valley (2003) and Minaret and Archaeological Remains of Jam (2002). 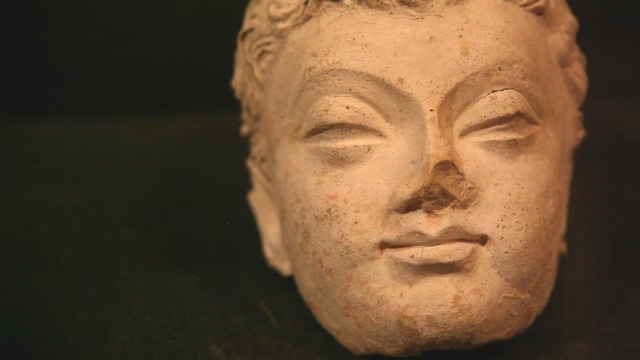 Here's a link to the Penn Museum blog with a post about Mess Aynak. 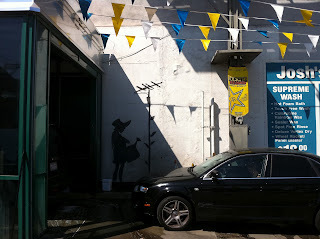 Street art tucked away in corner of car wash at La Brea and Beverly in Los Angeles. Graffiti and street art can be found in the Los Angeles neighborhood around the intersection of La Brea and Beverly Boulevard of expensive beauty salons and clothing boutiques amongst a community of Hasidic Jews. Yesterday a gas station and car wash displayed a rumored Banksy work that has been covered up for years. When I took a few photos with my phone camera, a worker told me, "Ten dollars for a photo." I laughed and he didn't push the point. Another artwork reputedly by Banksy boarded up is proposed for an auction sale according to one consultant. For your fun, here are a few photos of designs visible on September 6, 2012. "SMILE YOUR BEAUTIFUL" by WhIsBe posted on a utility box in front of a sidewalk portrait. The official application period for ARCA's 2013 Postgraduate Certificate Program in Art Crime and Cultural Heritage Protection has opened. The Association for Research into Crimes against Art (ARCA) 2013 Postgraduate Certificate Program in International Art Crime and Cultural Heritage Protection Studies will be held from May 31 through August 12, 2013 in the heart of Umbria in Amelia, Italy. This interdisciplinary program offers substantive study for art police and security professionals, lawyers, insurers, curators, conservators, members of the art trade, and post-graduate students of criminology, law, security studies, sociology, art history, archaeology, and history. Students explore such topics as: art crime and its history; art and heritage law criminology; art crime in war; the art trade; art insurance; art security; law enforcement methods; archaeological looting and policy; cultural security; and art forgery. **Some students stay a few days longer to participate in the August Palio dei Colombi, Notte Bianca and Ferragosto festivities. For questions about programming, costs, and census availability, please write to us for a complete prospectus and application at: education@artcrimeresearch.org. in 1972 and remains missing. Forty years ago today three men robbed the Montreal Museum of Fine Arts -- they have never been caught and 17 of the paintings have never been found. 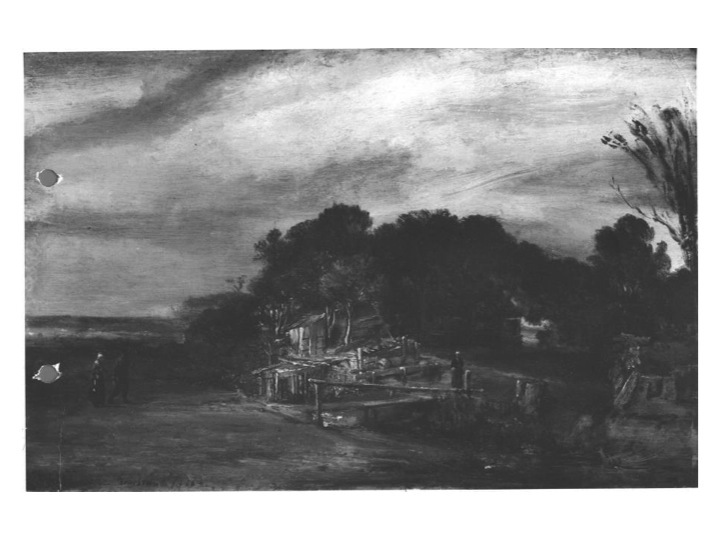 When three men stole 18 paintings by such well-known artists as Rembrandt, Corot, Courbet, Breughel and Millet from the Montreal Museum of Fine Arts on September 4, 1972 it was the largest art theft in North America. The thieves have never been arrested for this art heist and the pictures remain missing but it was not the perfect crime. The setting off of an old security alarm scared the thieves off and prevented them from stealing more art. And the attempt to ransom back the loot, which also included 39 pieces of jewelry and decorative art, failed. One of the difficulties of describing the robbery of the Montreal Museum of Fine Arts in 1972 is that the police do not show the crime's files to journalists or researchers since the case remains open. Luana Parker's reporting after the heist for The [Montreal] Gazette under the headline "Art worth $2 million stolen from museum" provided the foundation for much of information about the thieves' physical description and how they stole the paintings and 39 pieces of jewelry and decorative art. Her work is footnoted in an academic article on this subject published in the Spring 2011 issue of The Journal of Art Crime. Five years ago, retired journalist Bill Bantey, the museum's director of public relations and the first official alerted to the art heist, wrote an article about the theft. In 2009, I met with Mr. Bantey and retired Montreal police officer Alain Lacoursière to piece together information about the theft. Mr. Lacoursière discussed information he recalled from working on the case in the 1990s while investigating art crime. 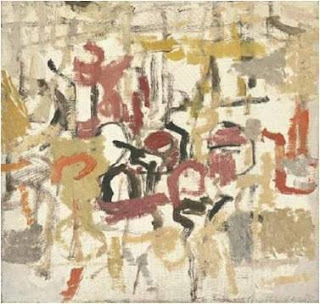 The Montreal Museum of Fine Arts was robbed in the early hours of Labor Day on September 5, 1972. The city had plenty of distractions that weekend. On Friday night, three men set fire to the Blue Bird Café and Wagon Wheel killing 37 people of the 200 trapped on the supper floor of the country western bar. On Saturday night, Canada's national hockey team lost 7-3 to the "amateur" team from the Soviet Union which stunned overly confidant fans. Sunday's newspapers were filled with stories about the victims from Montreal's fatal fire, otherwise Montreal residents were looking forward to a rematch against the Russians in Toronto the next day and marking the end of a summer exposition with fireworks. The Montreal Museum of Fine Arts, the city's most prestigious art gallery was expecting a quiet weekend. The museum's director, its head of security, and even the president of the Board of Trustees were on vacation in Mexico and the United States. The 60-year-old building housing the art collection, created through donations from some of Canada's wealthiest residents, had a skylight under repair and was scheduled to be closed for a major renovation. They said they saw two long-haired men, about five feet, six inches tall, and wearing ski hoods and sports clothes. One spoke French, the other English. But they heard another French voice of a man they never saw. The thieves planned to escape in a museum panel truck parked in the garage. However, one of the thieves "tripped the side-entry alarm on his way out with the first load, the men ran out, taking what they could" (Parker). While Parker reported that the thieves "escaped in a panel truck", Alain Lacoursière told me that the thieves ran out of the building, carrying only half of the paintings that they had selected. There was a sea of broken frames and backings, and smashed showcases. Upstairs in the room where the major theft took place, it was just devastation. They'd cleaned it out completely. For the second pile, they'd gone around selecting from various rooms. I shudder when I think what might have been if they hadn't opened that door ... With what they'd proposed to remove, if they'd been undisturbed -- it was just like they meant a general clear out of the museum. Mr. Bantey organized a press conference a few hours later and released information about the stolen paintings. Only one painting was recovered a few months later. You can read more about the theft on my blog here and see images of the stolen paintings.